Photo: France’s Kylian Mbappe, left, passes the ball for the opening goal next to Iceland’s Kari Arnason during the Euro 2020 group H qualifying soccer match between France and Iceland at Stade de France stadium in Saint Denis, outside Paris, France, Monday, March 25, 2019. 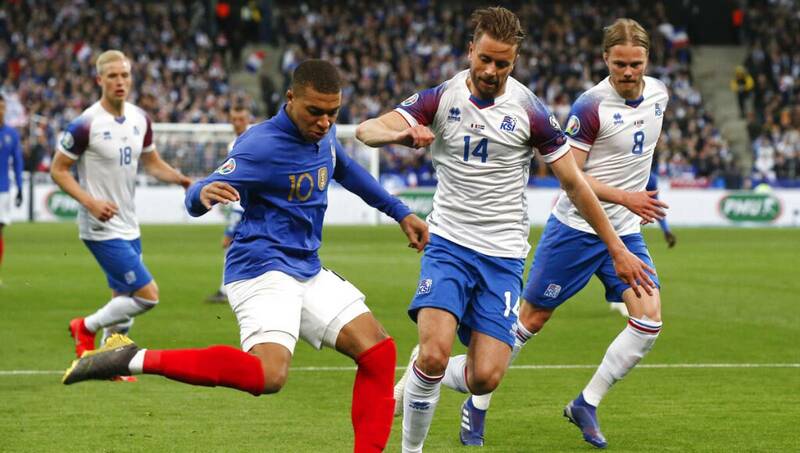 Paris, Mar 26 : World champion France fully capitalized on Iceland’s defensive deficiencies and lack of imagination to demolish the North Atlantic nation 4-0 in qualifying for the 2020 European Championship on Monday. France had the upper hand in all areas and could have scored more in the second half if not for its forwards’ profligacy in front of goal. Giroud then scored his 35th international goal to become France’s outright third highest-scoring player ahead of David Trezeguet, making the most of a botched clearance from Halldorsson to poke the ball into the net with his thigh.